Sound ID has announced the launch of its latest Bluetooth headset – Sound ID 400 Personal Sound System, which combines PersonalSound, Environmental Mode and NoiseNavigation impressive features in a single device. 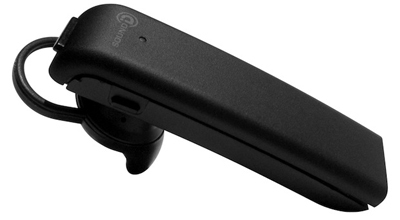 Compatible with Sound ID CompanionLink Remote Microphone, the small clip-on device which measures a mere 2-inches in size, syncing with Sound ID 400 to enhance the clarity of speech in variety of communication situations. The new Sound ID 400 which measures 53.5 x 15.5 x 7.5 mm and weights just 8 grams is scheduled to hit the market in Q4 for approximately $130, while the Sound ID CompanionLink Remote Microphone that supports up to 10 hours of talk time will be available by Q4 2009 for around $80.